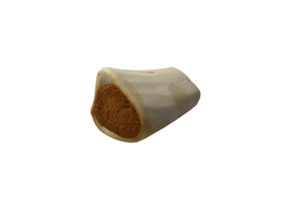 3-4 Filled Bone Bacon and Cheese Flavor combine cut femur bones and the great Bacon and Cheese flavor. 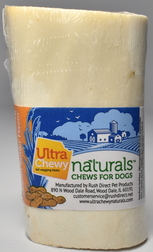 This treat has all the teeth cleaning advantages of the hard bone with a delicious taste dogs will crave. Beef bone. Filling: Beef meal, cheese and bacon flavor, vegetable glycerin, propylene glycol, potassium sorbate (a preservative), titanium dioxide color.